New Jersey residents finally could set off some fireworks legally on Independence Day last year, thanks to a law that ended the Garden State's blanket ban. But given that former Gov. Chris Christie signed the law just days before the summer holiday, this year marks the first time that New Jersey residents have had more than a few days to prepare their Fourth of July fireworks celebrations. New Jersey residents finally can enjoy the fun of non-explosive, non-aerial fireworks. That's a group that includes sparklers, party poppers, glowworms and smoke devices. Pennsylvania residents have had access to those items for years. But this year marks the first time they can legally set off aerial fireworks, including Roman candles, bottle rockets and mortars. With a range of fireworks newly available in each state, officials are putting out plenty of safety warnings. The Camden County Police Department urged Garden State residents to know the law and use any fireworks safely. Police issued a statement reminding residents that New Jersey law prohibits children younger than 16 from using fireworks. "Fireworks should only be used outdoors, away from buildings, cars and anything flammable," the statement said. "Always read the instruction labels, understand what the firework will do and move away quickly after lighting. Also never try to relight 'dud' fireworks that do not work the first time." In Pennsylvania, a Northeast Philly man who lost his eye during the Eagles' Super Bowl celebration is warning people to be careful with fireworks – if not stay away altogether. Rassan Urquhart, volunteer firefighter in Bucks County, a lost his left eye when he went to assist someone who was struggling to light a firework. A firework went off in his eye, leaving his face a bloody mess. "Just be careful," Urquhart told The Philadelphia Tribune. "Be careful with any dangerous thing. If you are going to buy fireworks, just be safe. If you can, stay away from them." • A responsible adult should oversee all lighting. Never give fireworks to children. 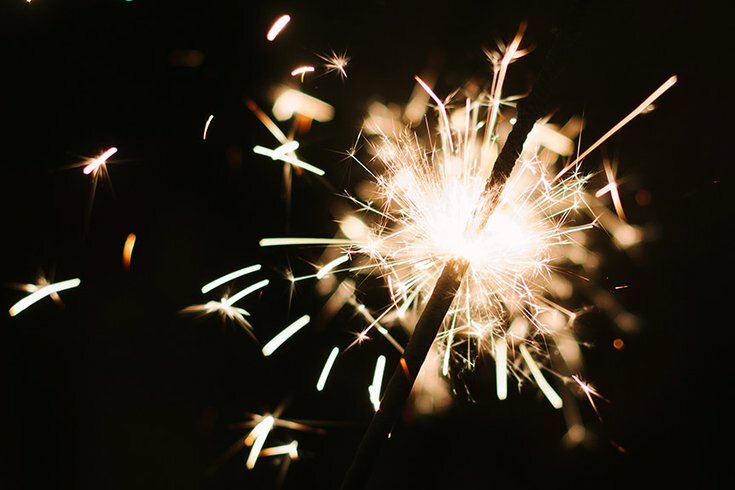 • Keep an eye on sparklers, which burn at high temperatures and can cause severe burns. • Only use fireworks outdoors in clear areas away from buildings and vehicles. Always have a bucket of water, a hose or fire extinguisher nearby. • Light one firework at a time and then move away quickly. • Never relight a "dud" firework. Wait 20 minutes and soak it in a bucket a water. • Do not carry fireworks in your pocket or shoot them into metal or glass containers. Do not experiment with homemade fireworks. • Dispose of spent fireworks by wetting them and placing them in a metal trash can away from buildings and combustible materials.